Canna (or Canna lily, although not a true lily) is a genus of nineteen (19) species of flowering plants. 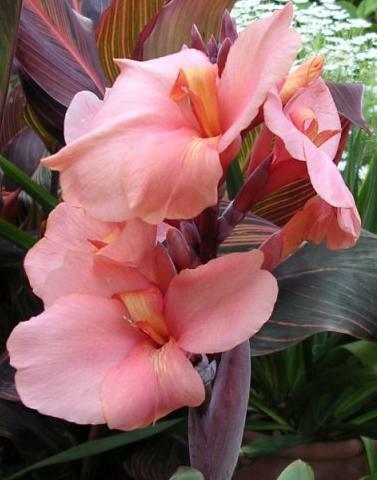 Canna lilies have leaves that fall into the large to huge range and flowers that follow suit. Site these horticultural Titans wherever moderate size shrubs would do, but would simple be too tame. As warm climate foundation plantings, along property lines lieu of fences and at the edges of ponds, reflected in the bright waters. If you are into the tropical look, don't miss growing the large and tall banana canna. 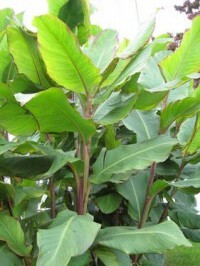 The 12-14' tall stalks are home to extremely large, banana-like leaves, each green with a purple-red border. While Canna 'Musafolia' rarely flowers, the flowers produced are small, red, and really pale in size compared to the foliage. This is a great canna if you're looking to make a statement in the garden.